Also Recommended: ...Working/Wagnaria, maybe? I'm honestly at a loss for what else to recommend. Notes: Based on the manga by Aloha Hige, published in Shogakukan's "Flower" magazine. This is the story of three friends. How they met, and how they spent their time. Panda, chased out of the house by his frustrated mother, finds a job at the local zoo as... well, a panda. Penguin's working life is more secretive, but he can often be found courting a female penguin at a local bakery, often met with failure and resulting in him lamenting his sorrows at Polar Bear's Cafe while offering the wares he picked up there during his failed courtship attempts. And Polar Bear? Well, he runs the cafe, and entertains his customers through good food, good service and a dry wit that is drawn from a limitless well. When it comes to comedy, I will readily admit I can be rather finicky with what I allow myself to digest. A couple of months ago, I watched -- well, synchroed, rather, with Tim -- a fast-paced, energetic comedy show named My Ordinary Life. And while I certainly didn't hate it or thought it was particularly bad, I came to the conclusion that comedy shows who never give its audience the opportunity to breathe and gather their thoughts... well, that just wasn't going to be my thing. Absurdist humor, however... now that I can get behind, provided it's got at least some grounded aspects to it. As such, Polar Bear's Cafe is actually a very good place to settle for when you're feeling a little peckish for some laughs. In a lot of ways, it's fairly reminiscent of Hidamari Sketch; it's generally quiet and lackadaisical, but will often whip out a gag, a joke or a line that'll leave you chuckling. The intro animation might have you think differently, though. Aside from being gorgeously animated most of the time, it's a relatively odd piece of what I'd label "flight of fancy", as it introduces us to our main trio, Polar Bear, Penguin and Panda as they drive their panda car throughout the countryside among the glowing butterflies, set to a tune not entirely unlike something you'd hear from Daft Punk injected with 30cc of Eurovision Song Contest from the nineties. And then, somebody presses the penguin button, and the panda vehicle transforms into a penguin plane/skimmer of sorts as it flies barely above ground level among the herd of other penguins sliding over the ice on their stomach, just before the polar bear button is pressed, turning the vehicle into a polar bear jet-propelled airship of sorts. The intro alone could almost be worthy of a review, as it's simply so damned gorgeous. It's the sort of thing that makes me pine for a Bluray license and release, and kind of crazy.... in a good way. Actually, it kind of occurred to me why, as much as I liked Polar Bear's Cafe, it took me some time getting used to it. A lot of the humor comes from the interaction between the various animals found in the show and the human beings, and most of that is the clearest when the show takes place in the zoo. The animals there come in during the morning, sign in and often chat with the zookeeper about what's expected of them. Kind of like how most jobs work, I'd imagine, except with the added dimension of weirdness. In fact, Panda taking a job as a panda kind of reminds me of another show I watched some time ago, called Panda Go Panda!. But while Panda Go Panda! was a children's movie of sorts, and therefor could get away with this by explaining it away as a child's imagination and naivetee, Polar Bear's Cafe bunches it together with a painfully straight portrayal of the lives of regular people, and the mix might make your mental processes derail from time to time. Neither does it really help that just about all the animals are drawn in very realistic fashion. Yes, it does look a little cartoonishly, mostly when the animals are talking, but outside of that, the manga artist has taken great care to keep animal design realistic, even proportionally at that, and also; none of them wear any clothes outside of maybe some headwear at times, or a scarf. But outside of that, they only wear the fur or the leathery skin or whatever else animals have. So, when Polar Bear takes Penguin on a "romantic evening exam", and duly whips out a "blonde hair with braids" wig, which he proceeds to put on his head... well, I wasn't sure how to feel about that. Never mind how you're going to wonder just how Penguin is able to drive a car in the first place. Once you get past that, though, the show is surprisingly pleasant. Aside from the relatively mundane events the show is centered around, the characters are oddly charming. Panda is, as pointed out, a rather lazy fellow. Yes, he does take a job as "Part-time Panda", but if it was up to him, he would rather live at home sponging off his mother. He seems oddly naive about how the world works; namely nothing is really for free, and I have to admit it's kind of amusing to witness this and the reaction it garners from his friends. Penguin, on the other hand, seems to be a bit more mature, even if we never really learn what he does for a living. He's mostly found at Polar Bear's Cafe, lamenting how he can never express his feelings for "Miss Penko" who works at a local bakery, which prompts his friend to provide commentary or aid, most of which meets with failure with a big bag of bread on the side. To the show's credit, it is thankfully too good for keeping running jokes alive past their expiration dates, so one day, Penguin actually manages to get his feelings across to his secret admirer, with hilarious unforseen consequences. And then, there's Polar Bear, the ever inscrutable proprietor of the show's namesake cafe. Don't ask me how a polar bear can run a cafe, never mind making elaborate dishes or drinks with his massive polar bear paws, but that is exactly what he does. 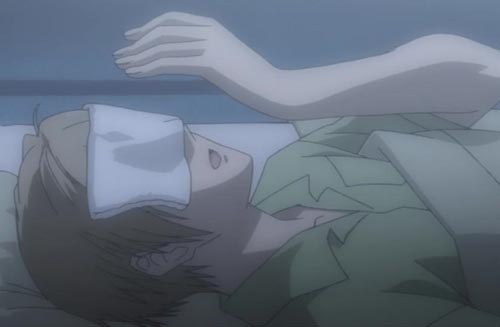 He's also a purveyor of a whole load of puns and playings on words, and while he never comes across as dumb, he has this aura of nonplussed obliviousness hanging over him that makes him very reminiscent of the aforementioned Hidamari Sketch's Miyako, and it makes me a bit sad that we don't really get to see him more often in the show. Especially since it's his cafe that lends the show its name, but more so because Polar Bear is a good friend of Grizzly, who runs a bar downtown called... "Bar the Grizzly" -- well, of course it would be called that. What else would it be? Anyway, the two of them have apparently known each other since childhood, and many, if not all, my favorite episodes are actually the ones incorporating the character somehow. Especially since Grizzly seems to be the one grounded the most in the "straight man" role, often voicing his frustrations with the others, particularly Polar Bear and Panda, and, surprisingly, striking up a close friendship with Penguin due to their similar work ethic. And if that wasn't good enough, one of the last episodes we watched told the story of how Polar Bear and Grizzly met, and the whole thing -- well, the half-episode, that is. All of the episodes are basically divided into two story arcs -- played out surprisingly heartfelt. And that's the crazy part: despite all the shenanigans, the comedy and the hilarious cluelessness of the Panda, the show is surprisingly true to life, however it works in Polar Bear's Cafe. Because where else would you watch an episode where a tiger and a wolf meets up with a lion in Grizzly's bar -- in what would otherwise be the opening line of a joke -- talking about where their respective lives have taken them, exchanging various images of their children and reminiscing about how they used to live out their youthful, carefree days as fan of a rap artist. And that's where we learn about Polar Bear's until then secretive past as 469MA ("Shirokuma". Geddit? ), a then famous rap artists, and with both Polar Bear and Grizzly overhearing the conversation, they decide that the three friends should be reunited with their childhood idol... through a rap performaAAAAAAEEAAAGH! Tim: *gives Stig a wet cloth* That'll do, Stig. That'll do. Like Stig, I really enjoyed Polar Bear's Cafe. It does take a while to get used to anatomically correct animals talking, walking, and working like real people, but once you get past that, you get a surprisingly funny series that even teaches you a few things about animals. I do think Panda eats up too much screentime, but his interactions with the rest of the cast, and how the course of the episodes change depending on who's he with (such as being a goof-off in the zoo with the "full time" Panda and the long-suffering zookeeper Mr. Handa, but a funny comedy relief in the Polar Bear/Grizzly episodes) helps this a bit. The humor - outside of maybe Polar Bear's highly Japanese pun forays - is pretty accessible to everyone, and I found myself laughing several times an episode. I also quite like the music in this series, and the continuously swapping ending themes are always amusing, even sung in-character by the series' cast members! (Though it's ironic that Grizzly, my favorite character, has the weakest song. Too bad.) Even the next episode previews are great. Polar Bear Cafe is my favorite comedy anime since Hidamari Sketch, and I highly recommend checking it out. Recommended Audience: People go to Grizzly's bar to get drunk, so expect some portrayals of that and apply whatever caution you think is appropriate. Outside of that, though, most of the characters herein are quite upstanding characters and not much in the way of darker stuff is going on. 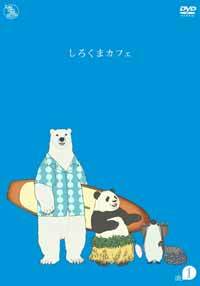 Unlike a lot of anime, however, Polar Bear is made with adults in mind, seeing as most of the characters are adults -- even the animals -- and might not come across as all that interesting to kids or teenagers. Version(s) Viewed: Digital stream, sub only.